Statute of St. Denis, Notre-Dame, Paris. Being beheaded can really mess up your day. 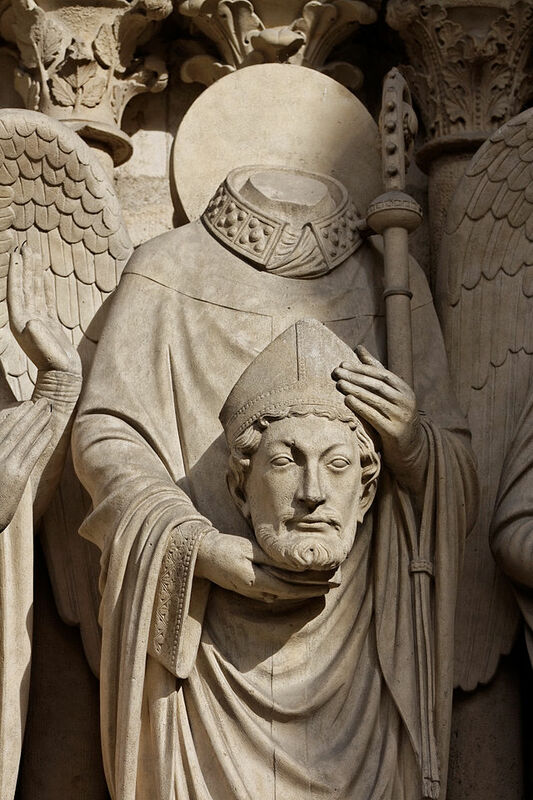 But according to Christian tradition, after Saint Denis was decapitated, he simply picked up his head and kept walking and preaching. So it’s perhaps no surprise that Denis (pronounced “duh-KNEE” in French) is the patron saint of headaches. St. Gregory of Tours tells us that Denis was born in Italy in the 3d century A.D. In 250, he was sent as a missionary to Gaul (modern-day France), where he became the first Bishop of Paris. Paris, however, was still largely a pagan city. And the Parisians didn’t take kindly to Denis converting so many to Christianity. They took Denis and two of his companions to the highest hill in Paris — Montmarte — and decapitated them. In all likelihood, Denis’ body was thrown into the river Seine and fished out later by his converts. They buried it and erected a shrine six miles to the north, in what is now a suburb of Paris called, appropriately, St. Denis. But according to the 13th century Golden Legend and Butler’s Lives Of the Patron Saints, it was Denis himself who carried his severed head to his burial site, preaching a sermon the entire way. Whatever the true story, a chapel was eventually built over St. Denis’ tomb. In the 5th century, Saint Geneviève* began construction of a basilica on the site. Two centuries later, Dagobert I, king of the Franks, founded a monastery nearby. The attached church became the Abbey (a/k/a the Basilica) of St. Denis. 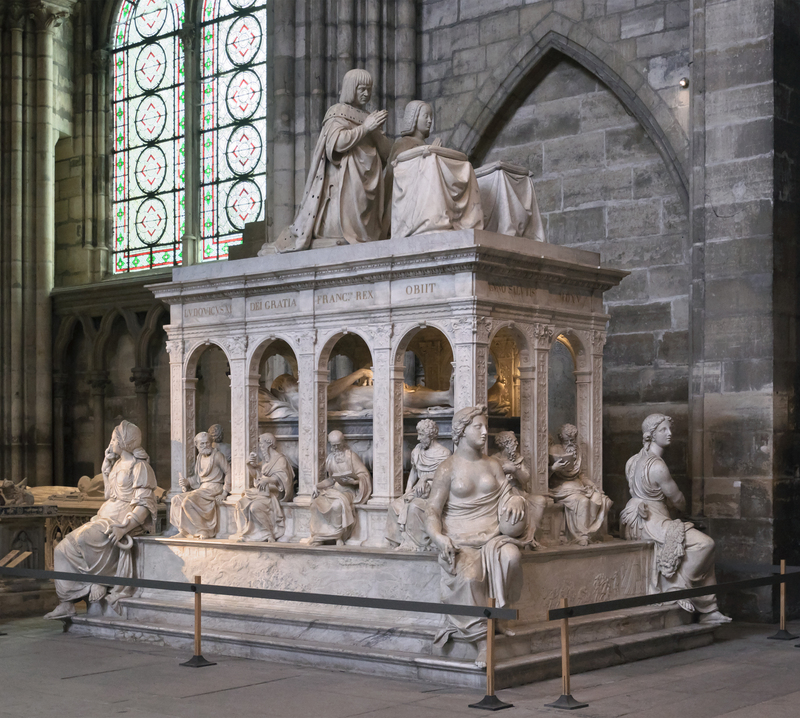 Tomb of Louis XII and Anne of Brittany, Basilica St. Denis, France. The basilica itself is an architectural marvel. Construction was begun by the Abbot Suger in 1136 and completed at the end of the 13th century. It is widely considered the first major structure to be built in the Gothic style of architecture. Particularly noteworthy is St. Denis’ stained glass, much of which is original. 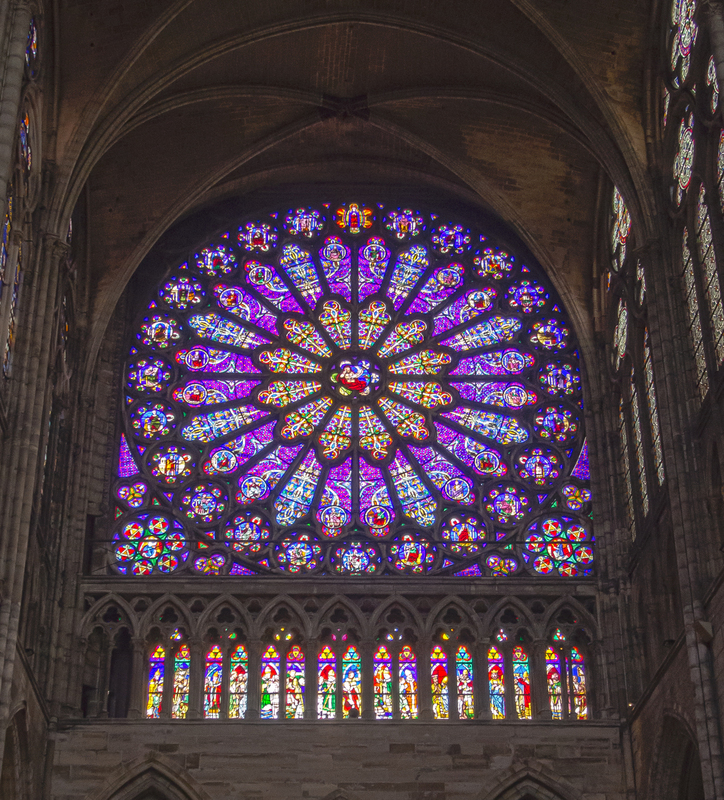 The rose window in the Basilica St. Denis. Statues of Saint Denis abound throughout Paris. He is usually depicted holding his head and wearing a mitre, even though mitres were not used by Catholic bishops before the 10th century. Saint Denis is honored as one of the Fourteen Holy Helpers. These are the saints venerated in Roman Catholicism for their intercession against disease. In addition to being invoked for headaches, Denis is also said to protect against and rabies and its accompanying hydrophobia (fear of water). Together with Sainte Geneviève, Saint Denis is the patron saint of Paris. His feast day is celebrated on October 9th. *Saint Geneviève was no slouch in the miracles department either. When Attila the Hun was marching on Paris, Geneviève persuaded the inhabitants to fast and pray, rather than evacuate the city. Her assurances of the protection of Heaven reportedly worked — Atila suddenly changed course and left Paris alone. This entry was posted in Diseases, France, History, Religion, Uncategorized and tagged Abbot Suger, Basilica St. Denis, beheading, Dagobert, decapitation, Golden Legend, Gothic architecture, headaches, hydrophobia, Lives of the Patron Saints, Montmartre, rabies, royal necropolis of France, Saint Denis, Sainte Genevieve, St. Gregory of Tours by Jackie Fuchs. Bookmark the permalink. I just happened upon your blog and I love it! I can learn a lot from you. Thank you. Enjoy your day.